Threaded end Power Team hydraulic cylinders are available with capacities ranging from 5 to 25 tons (133 to 362 mm stroke). Threaded cylinder collars, piston rod and internal base threads make the housing of accessories and adapters a simple job. Whether you’re after a 5 or 25 ton threaded end cylinder, at SGS we have an excellent choice available so you can easily find an option that will meet every requirement. Single-acting, spring-return cylinders with a threaded piston rod end makes them effective for various applications, with it possible to attach accessories and adapters. 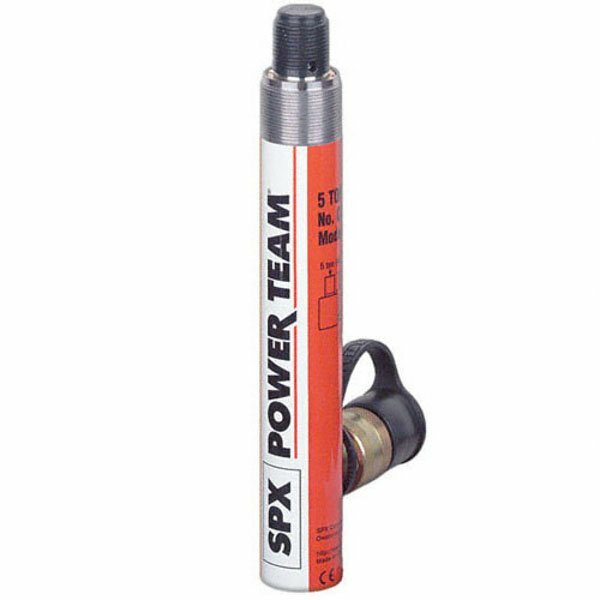 All our threaded hydraulic cylinders are from one of the industry’s premier brands, Power Team. We are proud to be Europe’s largest stockists of Power Team tools, offering an affordable price for equipment from such a highly regarded brand. Each item has been manufactured to the best standard and comes with a lifetime Marathon Warranty. All orders placed above £100 qualify for free next day delivery so you can have a brand new threaded end cylinder at your home or workshop in no time. Each one is proof tested to 125% capacity so you can feel safe in the knowledge that whatever product you choose it will perform. If you’re unsure about which of the threaded end cylinders for sale are right for you then call our technical department on 01332 576 850 and speak to our friendly technical team. They will be more than happy to help you out and ensure the correct threaded end cylinder is bought.